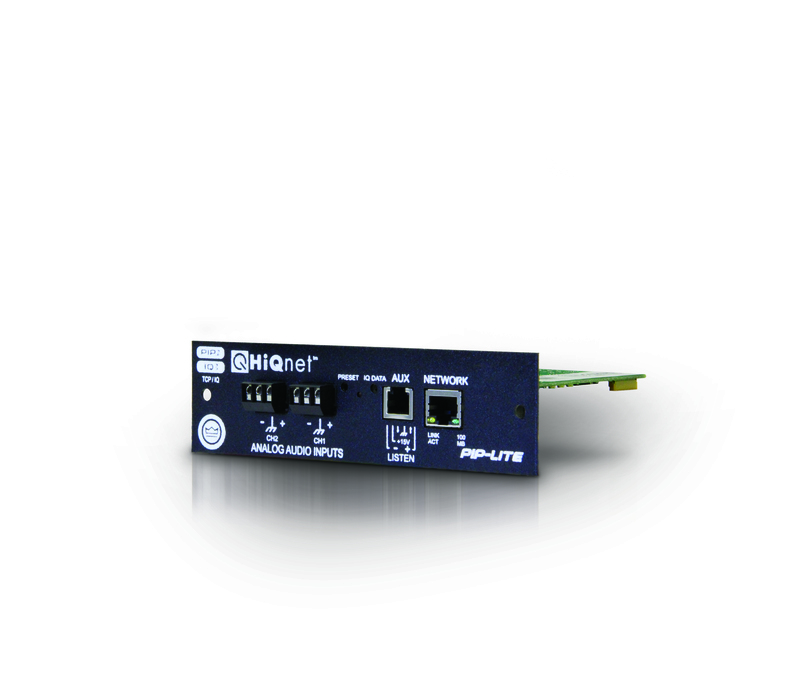 PIP Lite -- Integrates Ethernet-based IQ Network™ control via 100-Mb TCP/IQ protocol for digital control of analog devices. Since audio signals are not converted to digital, a larger dynamic range is possible. Digital signal control allows for error trapping and a proactive response; provides input compression, multimode average power limiting, peak power limiting, thermal limiter, clip limiting, and load monitoring. Requires FREE IQwic™ software and a computer for initial setup. An IQ Network™ Programmable Input Processor with TCP/IQ (connects to an IQ System via 100 Mb Ethernet). Remote control and monitoring of PIP2-compatible Crown amplifiers and some PIP1. Can be connected to the same network used to pass CobraNet audio. Implements SmartAmp features: input compressors, multimode output limiters, error reporting and load monitoring. AUX connector configurable for AUX input, AUX output, or Listen Bus. Power Requirements No external power is required. 160 mA at +24 VDC and 50 mA at -24 VDC. When installed inot a Crown PIP2 compatible amplifier, the unit receives +/- 24 VDC from the amplifier.